The quinta is situated near the 270 in Santa catarina. We are 25 minutes drive to the airport, close to the a22 central motorway. Tavira is our nearest town. It is an old olive tree farm with 6 cottages that sleep up to 5 people in each. There is a bedroom in each with twin beds and a lounge with 2 further beds in that can also be used as sofas. 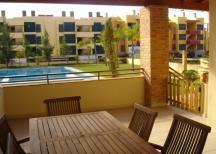 Each cottage opens out onto the pool terrace. Breakfast is included in the price. We have stunning grounds with many varietys of fruit trees, including olive and fig. We have many original features of the farm, eg the original well. We have a tennis court, games room with pool table and table football. We have a bar/bisto with satelite tv and a ps2. Meals can be made to order with the freshest, finest ingredients. 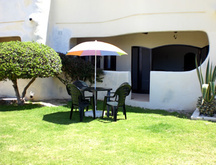 We have wireless internet, many outdoor seating areas, a sauna and swimming pool with roman steps. There are many beaches nearby, golf courses and places of interest. From Faro airport take the A22 towards tavira or spain, take junction 15 signed Santa catarina/olhao. At the roundabout take the 3rd exit to santa catarina. After appox 5 kms you will reach santa catarina. at the roundabout take the first exit for about 2 kms and Quinta fionte bispo is on you left. Alternatively from Tavira, follow the EN 270 for approx 10 kms until you reach Fonte Bispo and the quinta is on your right. We have a long whit wall with a turqouise strip along the bottom. Please quote reference: a4m: 761 farmhouse "quinta fonte do bispo"